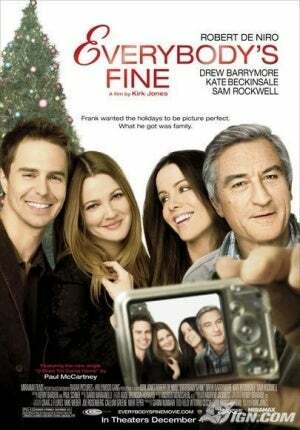 I came across ‘Everybody’s Fine’ starring Robert De Niro along with Drew Barrymore, Kate Beckinsale and Sam Rockwell. Considering the mighty starcast I assumed the film would be good watch. The movie is a family drama with Robert De Niro playing Frank Goode, a recently widowed father to 4 childeren who live across various parts of USA. On cancellation of their reunion plan he decides to visit them each and finds out more about their lives then he ever knew. De Niro plays his part very well and looks more intense then actually needed for the role. The role did not have enough challenge for an actor of his calibre yet he played it with enough seriousness. The other stars who all plays De Niro’s childeren do not have large enough and well defined roles. The movie is mostly about De Niro travelling across length and breadth of USA and learning truth about all of his children. He realizes that what he had dreamt for each of his children is not what the children have achieved and yet his guidance played a crucial role in them choosing their life’s path. The movie was a typical American family drama to be viewed during a Christmas or thanksgiving. The movie was not bad and not very good either. One can watch any movie starring De Niro and not be disappointed. This one is just par . My Ratings : 6/10 – Watch it for De Niro in a role not meant for him.